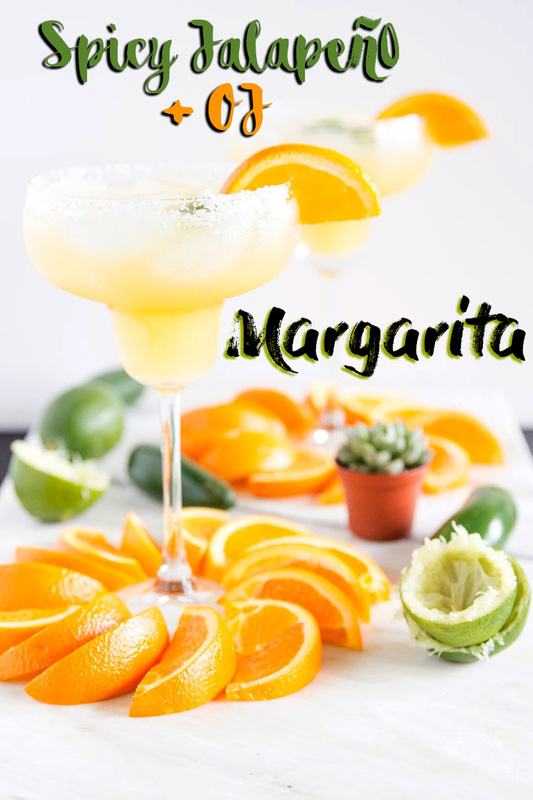 Cinco de Mayo is upon us, friends, and you know what that means... Margaritas! 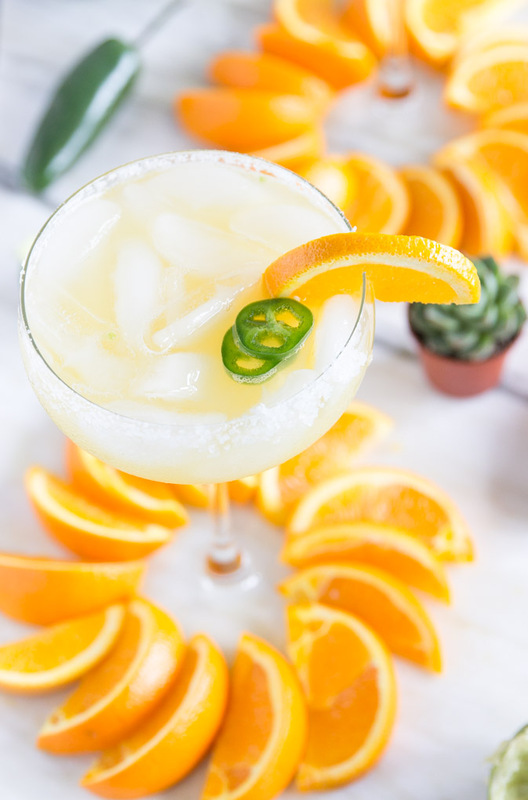 You could play it safe with a classic Marg, or you could be daring and make this sassy Spicy Jalapeño + OJ Margarita. All of which can be found at the grocery store with the exception of tequila. It costs pennies compared to specialty mixers or buying drinks out. Now, I LOVE a classic Margarita, but I wanted to kick it up a notch this year. I've just started warming up to the idea of spicy beverages. I've always loved spicy foods, but there was something strange about drinking spice. Well, I'm finally over my reservations and can really dig a spicy drink these days. What I love about this drink is that there's the sunny sweetness of OJ and a little agave to balance the spicy jalapeño and savory tequila with salt rim. I'm telling ya, when you take a sip of this drink and get all the satisfaction of that margarita limey flavor mixed with the sweetness of the OJ and kick of jalapeño, first you'll want to high five someone, then do a little dance (that's what I did ;) ). Ive seen some amazing recipes out there for orange tequila beverages or spicy tequila drinks but hadn't seen them together yet so I decided to give it a try and GOOD gracious, it was awesome. You can make this drink as spicy or least spicy as you want for guests depending on the amount of jalapeño you muddle and if you put the seeds in or leave out. Slice a few slivers of fresh jalapeño then mince and measure anywhere from 1/4 to 1/2 tsp (or more for spice fiends) and throw in shaker. Measure 1 oz. agave and pour in, then muddle jalapeño and agave mixture for about 15 seconds. From there, measure the rest of the ingredients: OJ, lime juice, & tequila then give the mixture a stir for 5-10 seconds. Fill shaker halfway with ice, pop on the top and give a good shake for 10-15 seconds. Here's to good Margaritas, Cinco de Mayo, and ALL the chips and guacamole to celebrate.... Cheers!